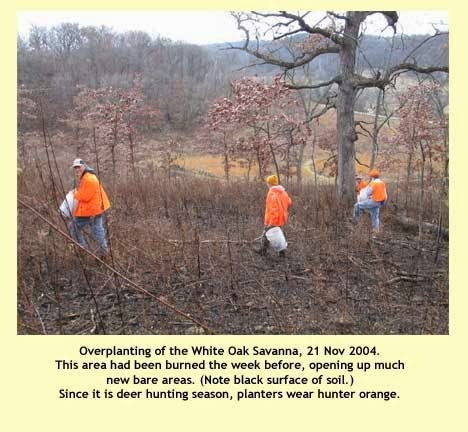 Now is a good time to think about planting herbaceous species as part of an oak savanna restoration. Although planting can be done either spring or fall, the latter is the best because planted seeds have the whole winter to settle and become stratified. My assumption is that the site to be planted has been extensively cleared of all invasive trees and shrubs. The only remaining trees should be open-grown oaks or hickories, plus scattered young oaks that might serve as "nurse" trees. My oak savanna restoration web site has lots of detail about planting, as well as a lengthy seed planting list (PDF) with a selection of suitable herbaceous plants. The ideal lead-in to fall planting is a good burn. This clears out most of the oak leaves and prepares the seed bed. Since the site has presumably not been burned before there should be plenty of oak leaves on the ground, so even in the absence of substantial understory vegetation there should be plenty of fuel to carry a fire. Wait for a reasonably warm day in late October or early November when it is sunny and the humidity is below 40-50% (conditions called "Indian summer"). A good wind also helps carry the fire. If the site cannot be burned, the seed bed can still be prepared. Rent or buy a hefty leaf blower and create zones of bare soil. Depending on the size of the site, this may be a fairly time-consuming job. However, it isn't necessary to clear all the leaves off the site. Choose areas to clear that have fairly open canopy, since these will be the areas where the understory will grow the best. 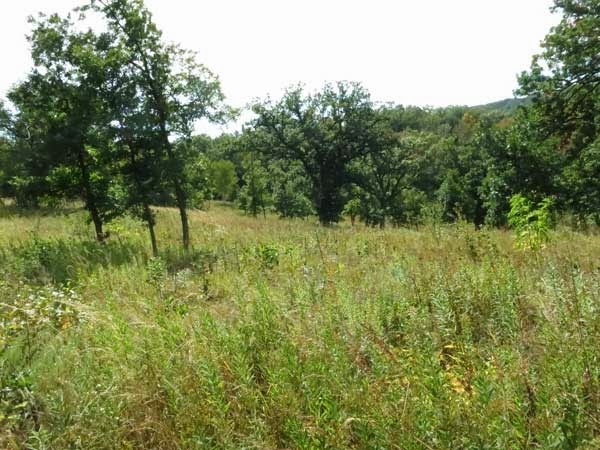 My oak savanna planting guide classifies each plant species by its light preference: no canopy (0-10% canopy), open savanna (10-30% canopy), closed savanna (30-70% canopy), woods (>70% canopy). For planting a typical savanna, the seed mixes can be simplified to prairie (0-20%) and open savanna (30-50%). Note that some of the species will grow in more than one area, so can be placed in more than one seed mix. In most cases making seed mixes will depend upon availability of each species. Remember that this is just a guide, and should be modified for each situation. The two-bucket method is the most efficient way of planting. One bucket has the prairie mix and the other the savanna mix. The south side of a large open-grown oak should get the prairie mix whereas the north side should get the savanna mix. The same savanna area in 2013 (11 years later). It has been burned annually, either fall or spring. In addition to annual burns, heavy brush control should be anticipated. The clearing of the savanna brings in a lot of light, and brambles and other brush that had been suppressed can now thrive. 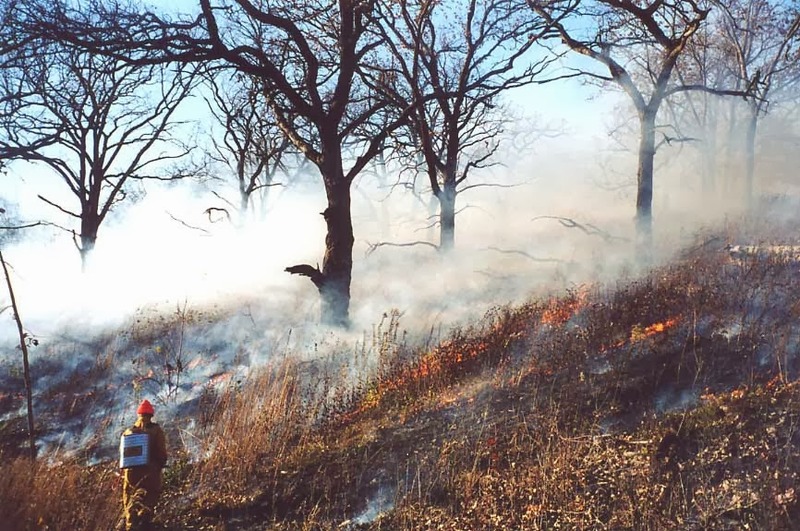 Even annual burns will not be enough to provide brush control. Our annual seed collecting event was held Sunday Oct 13 2013 at Pleasant Valley Conservancy and Black Earth Rettenmund Prairie. A total of 20 people participated in part or all of the activity. The photo here shows the morning group just before work began. Kathie is demonstrating procedures and techniques. Most of the morning collecting was done in various parts of Toby's Prairie, our 15-year old planted prairie. After lunch at the cabin, some of the group moved to Black Earth Rettenmund Prairie, where the afternoon work took place. We got lots of seed, the weather was great, and everyone seemed to have a good time. 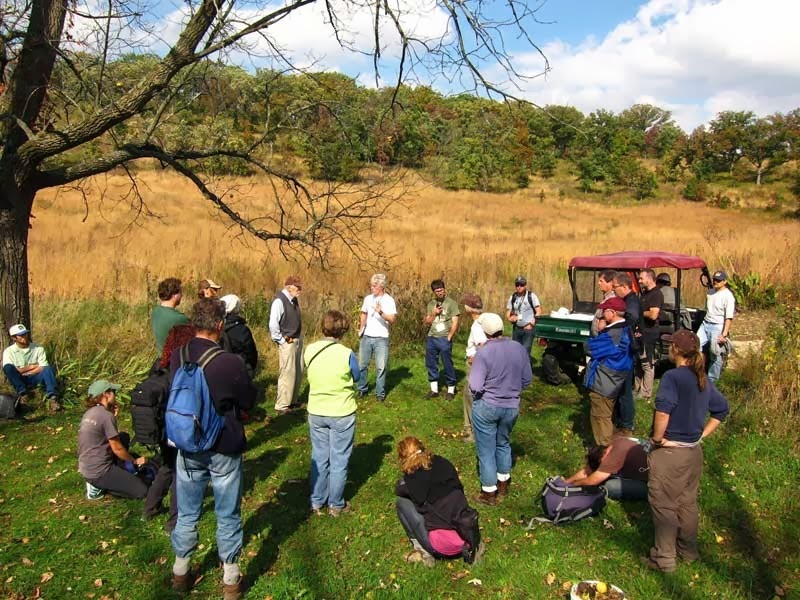 The Society for Ecological Restoration had its 5th World Conference Oct 7-11, 2013 in Madison. 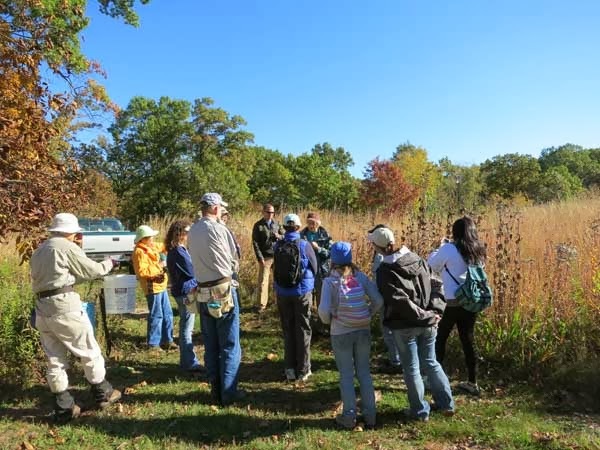 On Oct 11 Pleasant Valley Conservancy was pleased to help host the field trip on Oak Ecosystems Restoration in the Driftless Area. Twenty-one participants from a wide variety of locations had a chance to see results of our 15 years of restoration work. Two other sites were also visited: Sugar River Savanna and Pleasure (note spelling) Valley Conservancy. Kathie Brock was the principal leader, accompanying the tour bus from Monona Terrace through the whole day. Others involved were Pat Trochlell, Ken Wade, Amanda Budyak, and Susan Slapnick. I helped with some brief lectures. Because of the favorable weather, Pleasant Valley Conservancy never looked better! Appropriately for the trip title, the oak savannas and oak woodlands were lush. Fall color was in its early stages, with hickories in full color, white oak leaves starting to show tinges of color, and some Hill's oaks in full color. Susan's photo below shows the group at the Preserve entrance just before taking off. The trip members were intrepid hikers and got the full tour, across the whole ridge-top, down the ridge trail to the quarry, across one of the original prairie remnants (Kathie's Prairie), and ending with a hike across the Diagonal Trail along the south slope and back to the starting point. After the hike, Amanda and Susan gave a demonstration of seed collecting techniques in the barn. This has been a great year for purple milkweed growth and reproduction. I summarized the extent of growth and flowering at the end of June. Fortunately, rainfall has continued throughout the summer, so that we have had excellent pod formation. This has been the best year for pod formation since we started monitoring these milkweeds back in 1999. Finding purple milkweed pods is a little tricky, since by the time pods are developing the milkweed plants have senesced and are surrounded by lots of tall savanna species. Even though we have permanently marked all our purple milkweed populations, the plants move around a bit from year to year so they are almost never right by the stakes. Fortunately, our PVC crew is well-skilled in finding pods. Milkweed reproduction depends on a number of factors. First is pollination itself, which is a complex process. Also, self pollination does not occur, so several flowering plants have to be near by so that the pollinators (mostly solitary bees) can move from one plant to another. Then the weather has to cooperate throughout the time when pods are forming. We had 23 separate purple milkweed populations this year. About half of them had arisen spontaneously, and the rest are well established greenhouse-raised transplants. Almost all of these populations were multi-stemmed and had flowers, generally 2 or 3 umbels per stem. We visited each population in early September to see how pod formation was coming along. Eight populations were forming pods (35%). Among the umbels on these populations 17% formed pods. 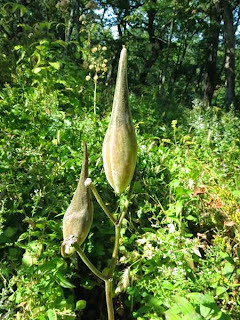 (Although each umbel is multiflowered, we have never seen a single umbel form more than one pod.) We collected a total of 39 pods. Not all pods mature at the same time, and it is a little tricky to decide whether a pod is ready to collect. Those shown in the photo are typical of good mature pods. If a pod is starting to split open it should be collected immediately. If the pod feels firm and full, it is a good bet to collect. If you have some doubts, make a small crack along the fission line and check the seeds. If they are ripe they should be a rich brown color. Sometimes you have to just collect the pod and hope for the best. The germination efficiency of purple milkweed seeds is very good. My laboratory tests have almost always found greater than 90% germination. We are often asked how to recognize a purple milkweed plant if it is not flowering. There are two other species found in the same kinds of habitat that might look similar. These are common milkweed (Asclepias syriaca) and poke milkweed (A. exaltata). Common milkweed is a clone former and is often found in large patches. Also, its plants are usually larger and its pods have distinct warts. Poke milkweed usually has narrower leaves, and generally smaller and thinner pods, but these are not reliable characters. A reliable method is to mark any nonflowering milkweed plant found in the woods in late May or early June and return to it in mid to late June and look for the flowers. The best time to find flowering purples is in mid-late June, especially in savannas or open woodlands. Purple milkweed (Asclepias purpurascens) is endangered in Wisconsin.